Duel New Honda Bros 160 VS Yamaha Crosser 150. Versatility is what many people look for when buying a bike small displacement. This review involving the "remarkable small" Yamaha Crosser 150 and Honda Bros 160 plays exactly this point. 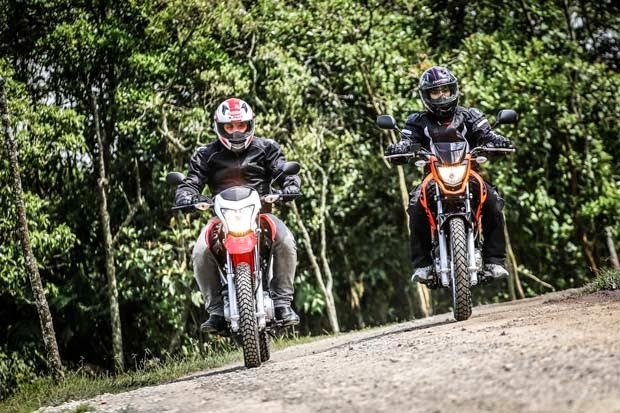 Both bikes have multiple qualities of double proposal on / off road, or are capable of running on asphalt and can also be used occasionally to venture, lightly, on rough terrains. After answering the Yamaha Fazer 150 with the CG 150 Titan equipped with brakes combined (see the comparative), Honda reacted to the launch of the 150 with the new Crosser Bros vitamin enriched by the 160 cc engine. 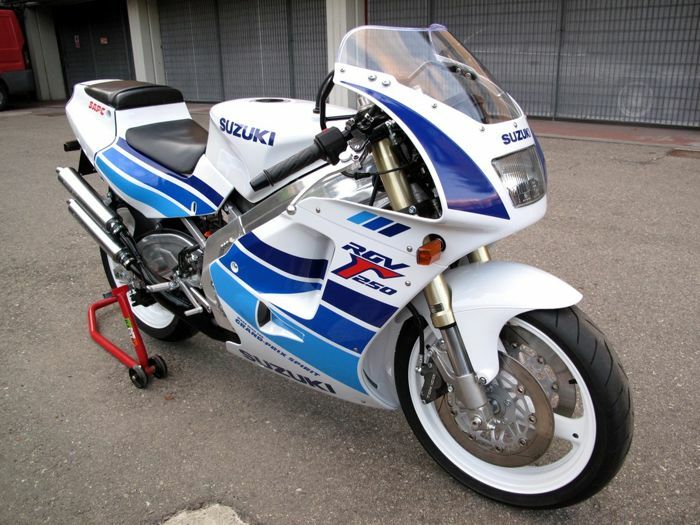 The mark of the wing, however, maintained its conservative approach: bringing even including a new chassis, the 160 Bros very reminiscent of the old 150 in style, not like a new bike really. And the design of it is even more grimace when put side Crosser to 150, with innovative and aggressive look, and stopped to compare them. 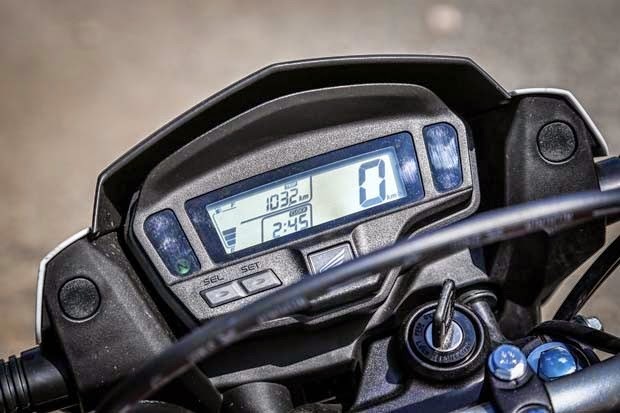 Yamaha also has an advantage in addition to the design, the tools, more complete and better display panel with tachometer (analog) and gear indicator, which does not exist in the new Honda. The Bros received 160 touch panel similar to the GC 150, much better than the old, but still short of the rival. At least it comes with digital clock, which is lacking in the Crosser. Another negative point for Bros appears in the rearview mirror, which has very soft rod and "silly", leaving the desired position very easily to face the wind. Also bothers the front brake cable going well in the driver's field of vision when looking at the panel. With regard to lighting, the lamps of both models do not fall short, working satisfactorily. 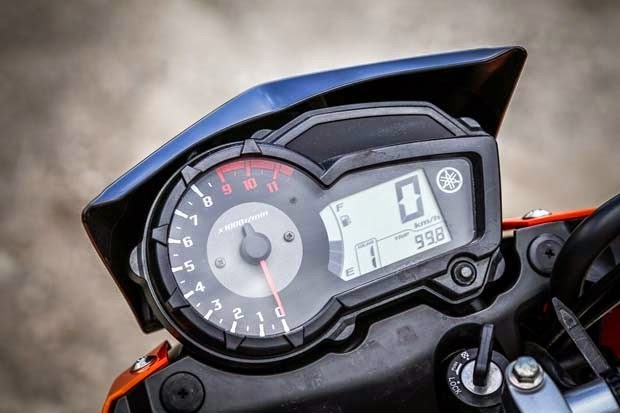 But Honda persists in different commands on the left hand: we have the hassle of horn buttons and arrow inverted in relation to bikes of other brands. At run-time, both bikes are very agile and easy to ride, since they are very light (120 kg) and have a very comfortable suspension. 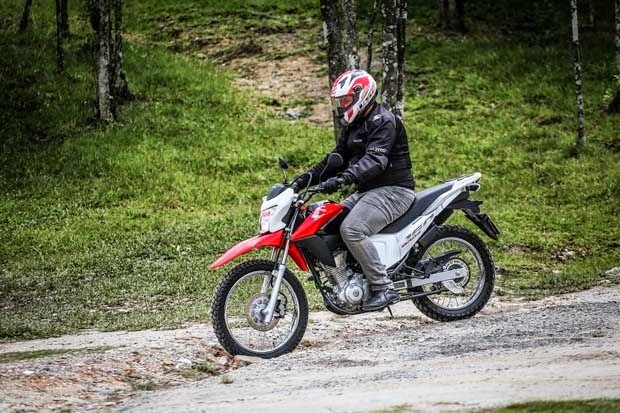 Right away Honda is claiming its new engine 160, stronger, with faster output that Crosser at the traffic lights, and resuming the speed with more force. Also worth mentioning that the couplings of the exchange Bros 160 are slightly softer than the Crosser 150. While the Yamaha declare their exact engine 149.3 cc delivers 12.2 bhp at 7500 rpm (12.4 hp with ethanol) and torque of 1.28 Nm at 6,000 rpm (1.29 Nm in ethanol), measured on the wheel, Honda discloses 14.5 hp at 8,500 rpm (14.7 hp with ethanol) and torque of 1.46 Nm at 5,500 rpm (1.6 Nm with ethanol) measured in the propellant of 162.7 cc. Taking the road during the evaluation, small on / off curiously walked together, although Bros have more engine. Guilt, perhaps, the fender top of the Honda, following off-road style and just acting as airbrake up to speed. Anyway, both are shown bound to travel to 120 km / h on the panel with some difficulty. Where there are increases, so it is best to slow down to avoid losing even more breath. Even with the larger database, Bros. has the harder foam, causing slight discomfort, either longer or shorter paths with respect to Crosser. Yamaha also provides better driving position, leaving the rider more comfortable, embedded, thanks to the higher handlebars (which can still be adjusted in two positions on the ED version). The small trail brand of tuning forks also get positive points with those of shorter stature, with 836 mm seat height, against the 842 mm Honda. 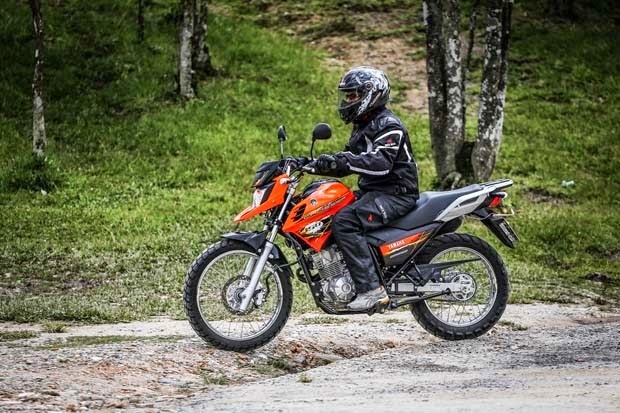 The suspension of the Honda NXR, very soft especially in the front, does not convey the same confidence that the Yamaha XTZ, firmer and better right to the city, as we could see during the evaluation. In Bros forward sinks more sharply in the braking and the whole balance more in bends, the Crosser better handling on asphalt, with good balance between shock absorption and stability. Honda goes well in the holes, but less so in fast corners. But when it comes to brake, then the Bros wins washed: equipped with disc brakes in the front and rear wheels (ESDD version), the new 160 passes much more security and halts in less space than the Crosser, equipped with disc on the wheel front and rear drum. Leaving a little of asphalt, it's time to carry out the assessment of motorcycles in the world, in more rugged terrain. Yamaha has more urban proposal, but pleased by the initial short marches, showing a stronger first to face climbs. The bike Honda has more power, but his first long march affect the performance on the slopes, requiring some "burned" in the clutch. The Bros. absorbs slightly better barriers, in addition to the height of top soil, but basically the two arrive at the same place in trilhinha. With respect to fuel consumption, models were evaluated by an average equivalent CARPLACE MOTORCYCLE shown. 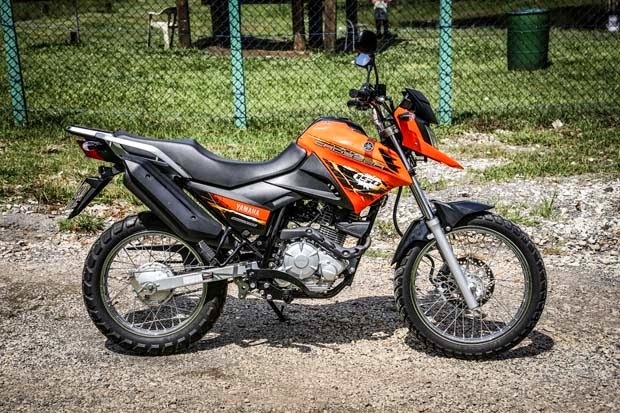 The Crosser recorded an average consumption of 33.2 km / l with petrol, little better than Bros, which had an average of 31.4 km / l with the same fuel. Remember that both are flex, accepting also be fueled with ethanol. In the end, the two small trail and fulfill the proposed function: the urban pleasing performance, agility, practicality and fuel economy, with the "bonus" of some resourcefulness on earth. 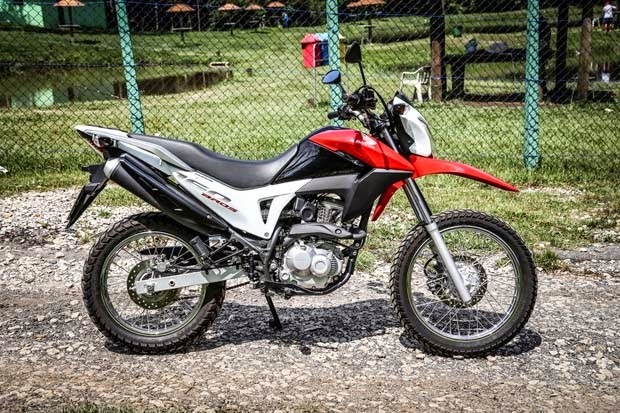 Yamaha Crosser 150 is offered by R $ 9,350 in version E (R $ 9,800 in the ED, with disc brake on the front wheel). Already Honda NXR 160 Bros has suggested price of US $ 9,811 in the ESD version (R $ 10,127 in ESDD version with disk brakes on two wheels). 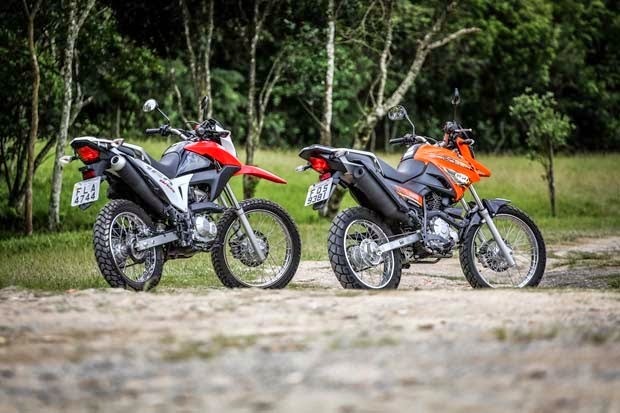 Taking into account the balance of the comparative and similar prices, the choice between them is a matter of priority: a new engine Bros opens the lead, brakes and transmission, while the Crosser gives the change in style, suspension and pleasure of piloting . What's yours? Engine: single cylinder, simple command, 149.3 cm3, electronic fuel injection, flex, air cooled; Power: 12.2 / 12.4 hp at 7,500 rpm; Torque: 1.28 / 1.29 Nm at 6,000 rpm; Transmission: five-speed exchange, chain drive; Table: semi-double cradle steel; Suspension: Telescopic fork on the front (180 mm stroke) and monoshock (156.5 mm stroke) on the back; Brakes: Single disc on the front (230 mm) and rear drum (130 mm); Tires: 90/90 rim 19 at the front and 110/90 at the rear rim 17; Weight: 120kg; Capacity: 12 liters tank; Dimensions: length 2050 mm, width 830 mm, height 1140 mm, 836 mm seat height, wheelbase 1,350 mm.